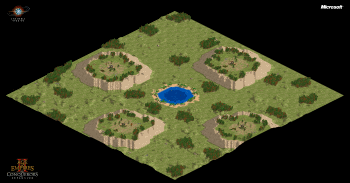 On this map, which was inspired by Age of Mythology, players begin on a hill with unbuildable cliffs, surrounded by a thin collection of trees. They will soon need to explore the land below, in order to expand their civilizations. This archive includes both the Acropolis map and the Team Acropolis map with grouped player placement. Both maps require UP v1.1, v1.2, or later for the cliffs to appear as intended. This random map was designed to emulate the experience of Age of Mythology players on their acropolis map. It recreates the general atmosphere and gameplay experience quite well, so it merits a 5 here. The idea of using UP to create the acropolis with beach terrain on the sides is quite novel and looks very good, though it looks better in AoFE where the black rock/road terrain is used. The map design is average; it doesn't look bad (actually quite good for a random map, with good elevation and forest placement with a nice oasis in the middle), but there is not really enough terrain mixing or eyecandy to merit a 4 or a 5. The random map is very fun to play. Defending your base can be difficult since you can't build on the beach terrain, so it fosters an offensive style. However, fortifications and units atop the hill truly pack a punch, due to the attack bonus for uphill advantage and attack penalty for being downhill. Otherwise, it plays like a normal random map. I had expected the sides of the acropolis to be cliffs like in AoM, creating small chokepoints to defend the entry to your base, which can be better for playability and certainly easier on a defender, but the gameplay is fantastic in its current state. A thoroughly recommended download and a fun map to play. A job well done!